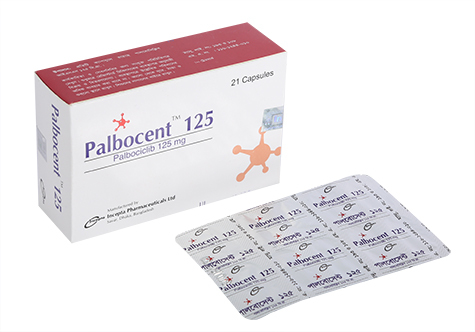 Palbocent 125: Each capsule contains Palbociclib INN 125 mg.
of Rb phosphorylation, downstream signaling, and tumor growth compared to each drug alone. • fulvestrant in women with disease progression following endocrine therapy. to the Full Prescribing Information for the aromatase inhibitor being used. 15, 29, and once monthly thereafter. Please refer to the Full Prescribing Information of fulvestrant. at the beginning of each cycle, as well as on Day 15 of the first 2 cycles, and as clinically indicated. potential risk to the fetus and to use effective contraception. miscarriage in clinically recognized pregnancies is 2%-4% and 15%-20%, respectively. and for 3 weeks after the last dose. The safety and effectiveness of Palbociclib in pediatric patients have not been established. Palbociclib has not been studied in patients with moderate or severe hepatic impairment. of Palbociclib has not been studied in patients with severe renal impairment.